Upcoming parent and clinician workshop (free) at Holland Bloorview! 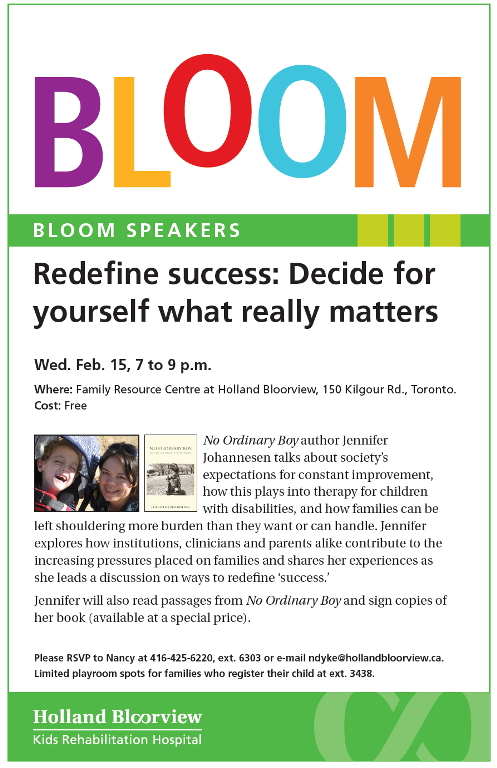 Holland Bloorview’s Bloom has launched an exciting new speaker series… and I’m honoured to be kicking off the series with a talk on Redefining Success. Details and poster below. Hope to see you there! LOCATION: Family Resource Centre at Holland Bloorview, 150 Kilgour Rd., Toronto. RSVP: Nancy at 416-425-6220, ext. 6303 or e-mail ndyke@hollandbloorview.ca. Limited playroom spots for families who register their child at ext. 3438. Jennifer will also read passages from No Ordinary Boy and sign copies of her book (available at a special price). Join us for a thought-provoking evening in the Family Resource Centre! The BLOOM speaker series brings you leading thinkers on childhood disability and parenting. Although I am most likely going to sit this one out, I am emailing to say, “congratulations!! !” I would also love to buy you a cup of coffee and catch up, as we both have more to give.